Nonprofit organizations invent new ways to raise revenue every year, as their mission is to generate ongoing funding for the causes they support. While the parties might have different themes each year and new corporations may offer their sponsorship, the typical sources for donated funds tend to stay pretty much the same over time. A basic set of methods forms the backbone of nonprofit fundraising, and the following offers a look at what makes up a healthy mix of income sources for non-profits. Even though you might automatically think of donations when you think about nonprofits, in reality, much of the income for the charitable sector comes from fees for services and the sale of products. According to the National Center for Charitable Statistics, such sources of revenue provided almost half (47.5 percent) of the total revenue for public charities in 2013. Another quarter of revenues came from government contracts for services. A public university, for example, is in large part supported by the taxpayers in that particular state. The university also charges tuition, receives government grants for research (in the case of military research, for example, the revenue is substantial), and sells products through its bookstore and tickets to artistic and athletic events. A nonprofit hospital sells products in its gift shop and provides medical services paid for by patients, insurance companies, and the government. Although the total income for nonprofits comes from an assortment of sources, of which contributions are a part, individuals are the largest source of charitable donations for nonprofit organizations. According to Giving USA, total charitable giving in the U.S. reached more than $410.02 billion in 2017. Of that amount, 71 percent came from individuals. The rest of the philanthropic pie consisted of government and foundation grants, bequests, and corporate philanthropy. Corporate philanthropy has come to be an integral part of the identity of most large corporations and many smaller businesses as well. Corporate social responsibility (CSR) has become more important as consumers have become more likely to buy from socially responsible companies. Corporate funding can be a long-term commitment to certain causes and the charities connected to them, or it can be more episodic and market-driven, revolving around particular campaigns, events, and projects. Funding from corporations can be a good source of support for new initiatives, special programs, and special events. Nonprofits increasingly look for opportunities to form corporate partnerships for sponsorships and cause-related marketing. Companies also often help their employees give to charities and even match those contributions. Employee volunteer programs are popular, and some grants are tied to employee volunteer hours. Many nonprofits benefit from all levels of government. Prominent examples are public education, higher education, and the public media. 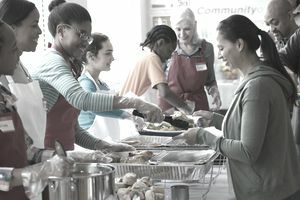 Federal, state, and local government grants fund many programs provided by nonprofits, especially for human service and healthcare. Grants.gov provides up-to-date information and a directory of federal grants. Community-based efforts such as United Way, United Arts, and community funds can be reliable sources of relatively large amounts of money. Federated funds have traditionally thrived because they supported employee giving at companies. Today, they have become less popular as new ways of employee giving have been established and as younger donors, such as millennials, seek to be more involved with the charities to which they give. Public charities are a cross between a private foundation and a charity. They typically receive funding from the general public, government, and private foundations. They may perform public service, but primarily raise funds and provide grants to other nonprofits that provide direct service. You can find many such grant-making public charities in your local area. Some are linked to a national organization; the Junior League is one such example. Grant-making public charities file IRS Form 990, so information about them can be found in many databases, such as at the Foundation Center and GuideStar. Foundations come in various sizes and types, but their grants can be substantial and significant. Corporate foundations are private foundations, but their boards are often made up of corporate officers. Their endowment funds exist separately from the corporation, and they have their own professional staff. Family foundations receive endowments from individuals or families. Many large family foundations have been around a long time and become household names. Think of the Gates Foundation, the Rockefeller Foundation, and the Ford Foundation. Numerous family foundations have endowments in the billions, but most family foundations are much smaller, tend to fund locally, and often have little to no professional staff. These types of foundations usually give money to their hometown charities. Community foundations are public foundations that pool the assets of many donors. They work to improve their local communities through grantmaking, awarding scholarships, and providing services to donors. Community foundations have become very active in providing donor-advised funds for donors who want to become more purposeful in their giving but don't want to set up their own private foundations. Community foundations today often organize giving days to help local nonprofits raise funds. Besides seeking support from a variety of sources, your fundraising program should find both ongoing financial support and episodic support. Recurring support usually comes through programs and activities such as the Annual Fund. An annual fund means just that—annual (or more frequent) appeals to a core group of constituents. Such funds are usually unrestricted—available for any use—and may represent a significant percentage of a nonprofit’s annual income. Sales of Products and Services. Some nonprofits own stores or provide services that can represent a substantial income stream. The Girl Scouts is one obvious example with its annual sale of cookies, and Goodwill Industries is probably the largest nonprofit retailer. A symphony or theater earns income through the sale of tickets. However, earned income must be related to the mission of the organization, or it can be taxed as unrelated business income. Multiyear Grants. A grant-giving organization such as a foundation may provide restricted funding for a particular program or unrestricted funding to help cover the overhead costs of running the organization. Endowment Income. Many large nonprofits, particularly higher education institutions, and healthcare organizations build up large endowment funds that produce interest that supports their programs. Episodic funding may come from a foundation or corporate grants, special events, or a bequest. These funds may be restricted or unrestricted. Capital campaigns have a beginning and an end but often span several years. A capital campaign employs all the usual means of raising funds such as direct mail and direct solicitation. Capital campaigns require extensive preparation and skillful execution. Most nonprofits now have planned giving programs that help donors include their favorite causes in their wills or estate planning. The charitable gift annuity has become quite popular among many donors as it allows tax advantages while providing income during the donor's lifetime. An effective fundraising plan includes a balance of these techniques and sources. Establishing unrestricted, ongoing funding is the most important task, followed by other funding that will grow the organization and ensure its future.